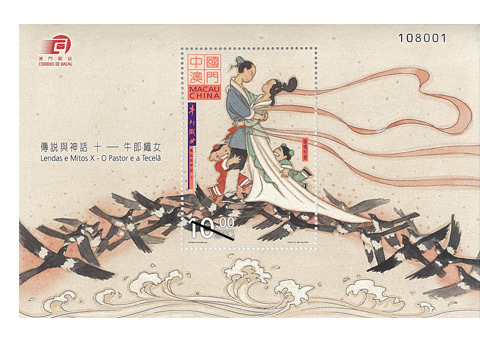 The Cowherd and the Weaving Maid is one of the four popular love legends of China. 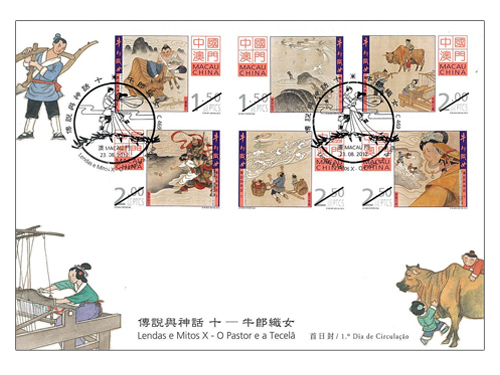 Macao Post will issue this stamp theme “Legends and Myths X – The Cowherd and the Weaving Maid” on 23rd August, 2012; it is the date Qixi Festival on the 7th July in the lunar calendar. 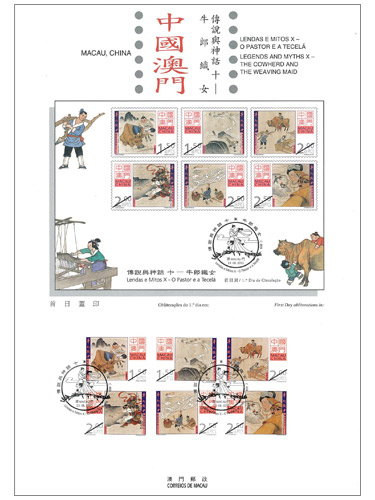 This issue includes a set of six stamps and one souvenir sheet, the stamp theme was selected from the classic plots from the novel. 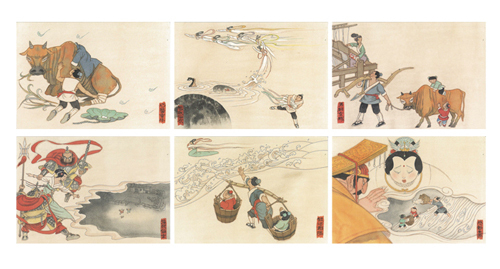 Among these are “Treating the Ox”, “Stealing the Weaver’s Clothes”, “The Cowherd Farms and the Weaver Weaves”, “The Weaver is caught”, “Separated by the Milky Way” and “The Gods are Touched”. The souvenir sheet portrays the plot of this moving classic novel “Meeting on the Magpie Bridge”. 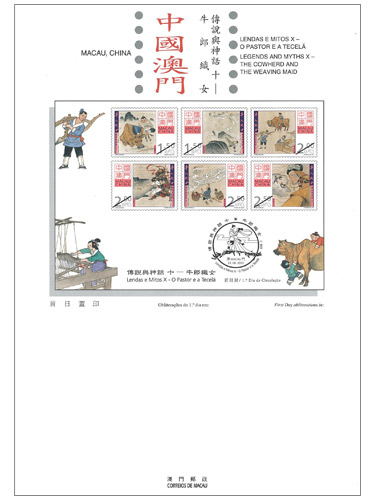 The stamp designer of this issue is Mr. Lio Man Cheong, and the text of the information brochure is written by Mr. Chan Su Weng. 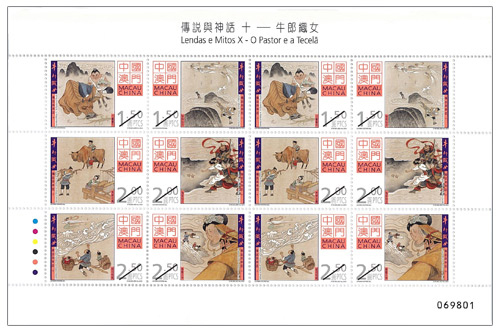 This is the eighth issue in 2012. 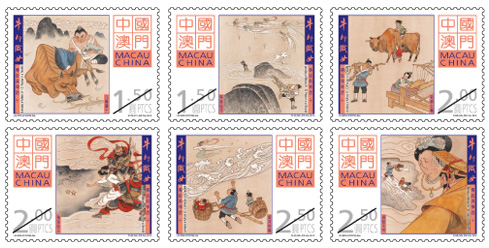 The previous issued stamps are “Lunar Year of the Dragon” on 05/01/2012, “A New Era of Smoke-free Macao” on 31/01/2012, “I Ching, Pa Kua VIII” on 01/03/2012, “70th Anniversary of Tai Fung Bank” on 28/03/2012, “Fishing Harbour in the Past” on 18/05/2012, “80th Anniversary of the Founding of Hou Kong Middle School” on 10/06/2012 and “120th Anniversary of Tung Sin Tong Charitable Society” on 08/08/2012. No próximo dia 23 de Agosto, pelas 11 horas, terá lugar a cerimónia de lançamento da emissão filatélica “Lendas e Mitos X – O Pastor e a Tecelã”, no Átrio da Estação Central da Direcção dos Serviços de Correios. 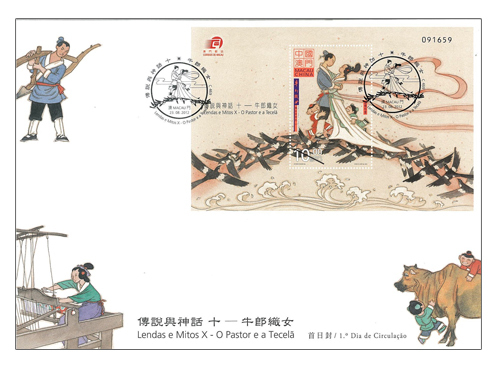 Na ocasião, haverá uma sessão de autógrafos pelo designer da emissão, o pintor Lio Man Cheong, que assinará os produtos filatélicos adquiridos pelo público. A sessão vai ter lugar entre as 11,30 e as 12,00 horas. 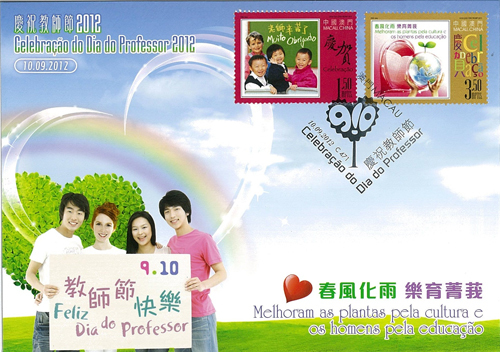 To celebrate the Teachers’ Day 2012, Macao Post announced that a Temporary Post Counter will be set up at our Philatelic Shop located at Macao Post Headquarters, from 9:00 to 17:30 on 10th September 2012 to provide the commemorative postmark cancellation service for the “Celebration of Teachers’ Day 2012”. 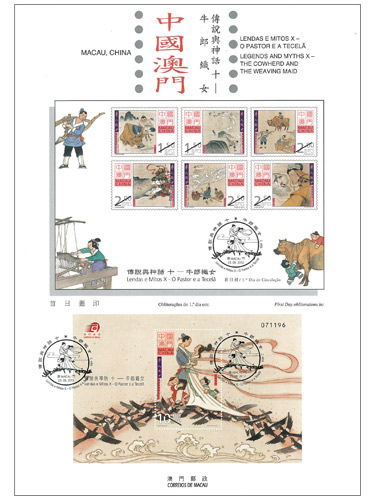 A commemorative envelope with stamp will be distributed to public, and various philatelic products will also be available for sale during the above activity.